From diagnosing personality disorders to reviewing drugs for schizophrenia, mental health services have come a long way since Mental Health Practice first rolled off the presses in 1997 – and nurses have been a crucial part of this cultural change. But what of the future for the profession? 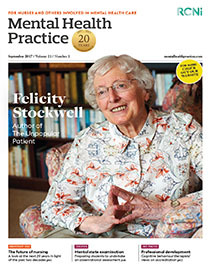 ‘Mental Health Practice is celebrating a major milestone this month as it turns 20 years old. For two decades this journal has been informing, championing, campaigning for and encouraging the work of mental health nurses.